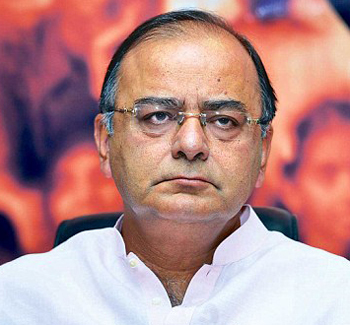 New Delhi, May 14 : Senior BJP leader Arun Jaitley Wednesday asked the Congress whether it has the capacity to accept that party vice president Rahul Gandhi could not "measure up" to their prime ministerial candidate Narendra Modi. "Does the Congress honestly have the capacity to accept that as the undeclared prime ministerial candidate of the party, Rahul Gandhi did not measure up in comparison to Narendra Modi? Being a party controlled by family, it is inherent in the belief of the Congress that the family can do no wrong," Jaitley said in his blog. "The Gandhis never make a mistake. Either they are being misguided or the responsibility of failure belongs to somebody else," he added. Naming the External Affairs Minister Salman Khurshid and Commerce and Industry Minister Anand Sharma, Jaitley said: "Salman Khurshid's reaction to my comment on Prime Minister Mammohan Singh was indeed disappointing. What was intended to be a gracious comment on the eve of the prime minister's farewell was retorted to by Salman in anger, if not discourteous." "Every time Anand Sharma appears on television, he is angrier than ever before. He conveys the impression he was born to rule and his right is being forcibly snatched away," he said. The BJP leader also termed Sharma's statement on the appointment of the new army chief as a reflection of "high degree of arrogance even in defeat".